2.0 lb. x 0.0005 lb. 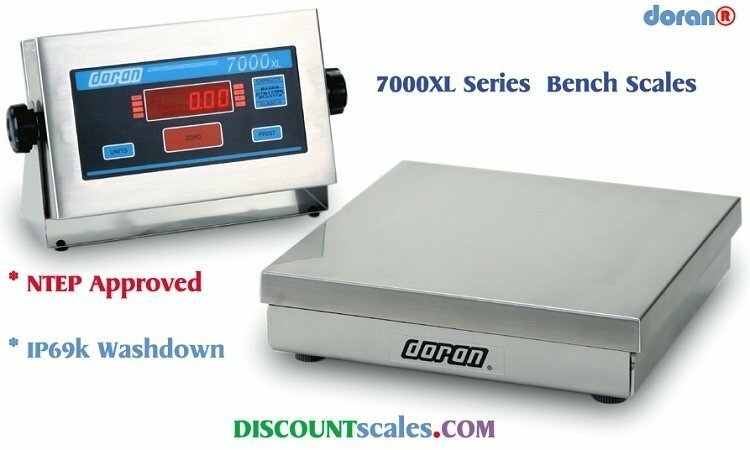 The Doran Excel Series 7000XL stainless steel bench scale is the latest evolution of our time-proven 7000XL Series Scales. For years it's been a workhorse in the toughest of working environments, now it can be put to work in a wider variety of tasks with the Excel Series Design. From a simple dough scale on a baker's bench to data collection device connected to a computer network, the 7000XL is adaptable to fit your specific needs. The basic controls are all here - Zero, Units, and Print, you can't get any simpler than that. The benefit to you is a scale that is easy to operate and train employees to use - thus, reducing operator error. Model 7000XL Bench Scale. The 7000XL indicator features an innovative gasket design that provides NEMA4X and IP69K protection - even in the harshest working environments. Engineered to stand up in the harshest environment, the sealed, super tough �Guardian�� touch panel resists moisture and puncture damage. Simple controls - ZERO, UNITS, and PRINT - make it easy to use, quick to train employees and prevents operator error. Really. 1000% Overload Protection! Our unique "Quad-Spring" design protects the sensitive load cell from shock and overload damage. Protected to a maximum of 10-times the base load rating sets the new industry standard - a feature only available from Doran. Take a "peek under the hood" to see what's inside our DXL scale base. Take the 7000XL to new levels with the enhanced features made possible with the new Excel Series Design. Choose from a variety of communication options include Wired or Wireless Ethernet. Control a mixing or batching operation by simply adding setpoints and relays.